In 1850, two years after John Bidwell discovered gold in the Feather River, the population of Butte County was 3574 (according to figures in Mansfield’s History of Butte County). Ten years later, the population had quadrupled to 12,106. 20% were Chinese. John Bidwell, 40 years old, is listed as a farmer. His name is followed by Oliver Proal, Farm Superintendent, and ten men listed as farm laborers. Then there is a chief clerk (Geo. Wood) and three clerks, a master miller and a miller, a millwright, a master wagon maker, master blacksmith and a blacksmith, two teamsters, two gardeners, and more farm laborers. These twenty-nine men are all listed at the same address (“dwelling-house”). John Bidwell was in 1860 living in his two-story adobe house. He certainly had room for some of these men, but they can’t all have been living with him. Some of them must have been living in nearby buildings, such as the grist-mill. 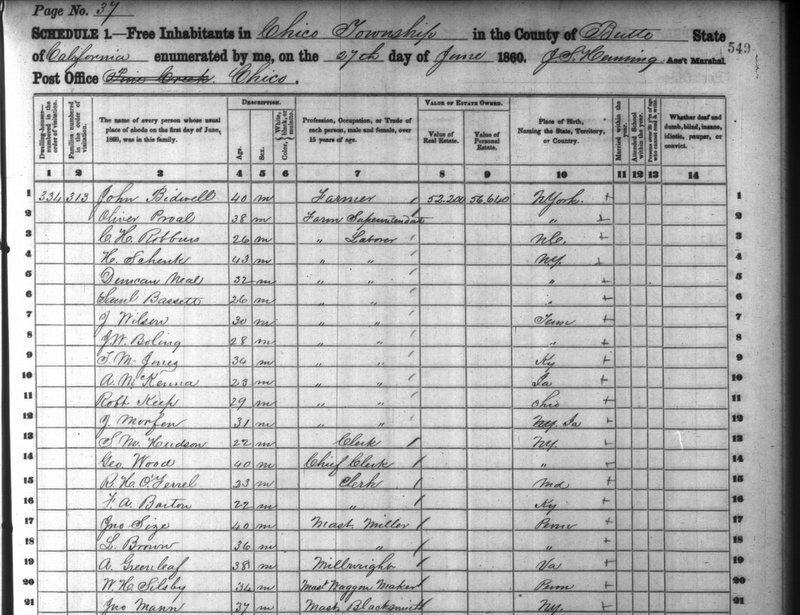 In fact, since the census taker skips a dwelling number in his list, going from 334 for Bidwell’s place to 336 for the hotel, it may be he forgot to record a bunkhouse or something. After Bidwell’s establishment the next listing is for A.J. Edgery, hotel keeper, and his wife Annie, plus their employees: a barkeeper and a hostler, two Chinese cooks and three Chinese waiters. Bidwell has no Chinese employees at this time. On the next two pages we see the Indians who worked for Bidwell and lived in their village near his house. There are 52 Indians listed, 41 males and 11 females. First on the list is Lafonse, 20, listed as a vaquero. Panch, Billy, and Nunco are herders. Eight men are gardeners, and most of the rest are farm laborers. Yummarine, at 43 the oldest man on the list, is listed as chief. Nopanny, 20, heads the list of women, who are all recorded as “day laborer” rather than “farm laborer.” Women and children and older men not directly employed by Bidwell were not counted. Bidwell’s real estate is valued at $52,200 and his personal property (livestock, buildings, etc) at $56,660. This is far and away the largest estate in the county. Other farmers have estates of anywhere from $400 to $4000 in real estate, with a couple as high as $10.000. A few representative names: Washington Henshaw $10,000 (real) and $4000 (personal), William Sharkey $10,000 and $7000, Thomas Wright $6000 and $2000, William Northgraves $6180 and $800, and James L. Keefer $3800 and $10,000. This entry was posted in Chico. Bookmark the permalink.